Articulating boom lifts, or knuckle booms, are used when a job requires placement or reach up and over machinery, equipment, vehicles, or any of the millions of obstacles that may be halting productivity. Utility work, maintenance, manufacturing, construction, destruction, and electrical work are just some of the endless tasks articulating boom lifts make easier. The wide platforms on top of articulating boom lifts may be rotated in a full circle. From the platform, the articulating boom lifts can be driven in any direction including reverse, even at full elevation. Articulating boom lifts can be raised to a completely vertical stature and lowered to below horizontal. On job sites containing narrow industrial aisle ways or congestion that may otherwise require relocation in order to continue progressing, articulating boom lifts take priority over other lifting devices. 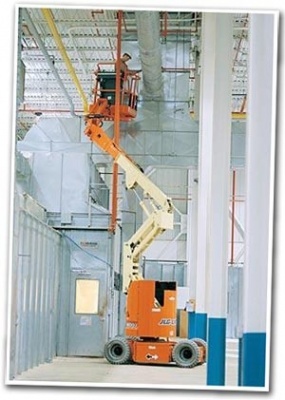 Why JLG, Genie, or Skyjack Articulating Boom Lifts? Since 1969, JLG has been researching, experimenting, and creating new ways to ensure the highest levels of safety and easiness when operating articulating boom lifts. Genie fisrt came onto the scene in 1966 and has been an innovator in the industry ever since. 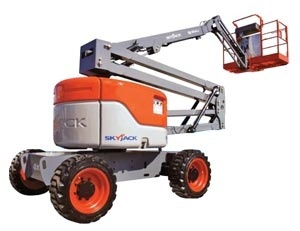 Last but certainly not least, Skyjack has been a major player in the aerial lift industry since 1986 and has an extremely dependable line of equipment. Bahrns Toyotalift trusts that articulating boom lifts from JLG, Genie and Skyjack will increase our valued customer's efficiency. They all offer dozens of factory designed accessories, leaving you with choices in ways to make your articulating boom lifts more productive. What Do Bahrns ToyotaLift's Articulating Boom Lifts Offer? • Horizontal platforms that elevate articulating boom lifts to up to 51 feet. • Some articulating boom lifts as little as 4 feet wide. The best way to find out everything you can about the articulating boom lifts that Bahrns ToyotaLift offers is to come in to our store and ask our knowledgeable staff. And of course, you can always call to ask about our articulating boom lifts at 1-800-432-2909. Contact us today to help you in selecting the right articulating boom lift.